On Saturday, April 25, I will be teaching ‘Ukulele Strumming Workshops at the 7th Maui Hawaiian Steel Guitar Festival at Ka’anapali Beach Hotel. New this year, there will three instead of two workshops available FOR FREE to participants. Read about the 2014 past event and see the 2014 photo gallery. Save your seat by pre-registering for the popular event today! ‘Ukulele 1 Workshop: 9-10:15 a.m.
‘Ukulele 2 Workshop: 11:30 a.m. – 12:45 p.m.
‘Ukulele 3 Workshop: 2-3:00 p.m.
Bring your own instruments. A few ‘ukulele will be available for hotel guests to use. Write to me at mele@ukulelemeleonmaui.com if you need to rent an instrument from me for use at a workshop. I will also have a few packaged song sets of Book/DVD/CD for sale. New this year, there are 5 different sets to choose from, each one for different skill levels and musical interests. 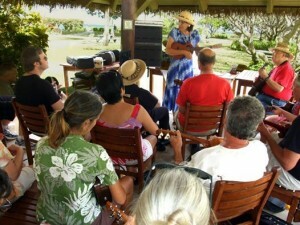 After the workshop, you can schedule private ukulele lessons on Maui or via webcam from home. You can also continue to learn from me via online lessons for self-study by monthly subscription from wherever you live.